This year at SolidWorks World I gave a presentation on Custom PCB Design with SolidWorks. It covers not only useful features in SolidWorks that can help make the Printed Circuit Board (PCB) design process faster, but also recommendations on the process itself. The presentation along with all the model files is available for download HERE. With some help from Ben Eadie and the folks at SolidWorks we are working on providing a video of the presentation from SolidWorks World 2009. As soon as it is available, I will post it here. Nice work, just keep it going! will definitely be back again! 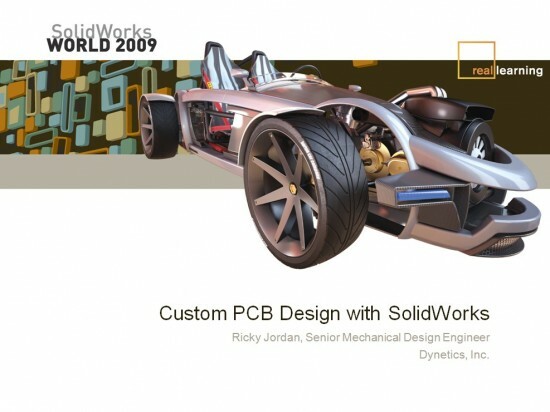 Where can I get some good information on 2009 SolidWorks router. I want to know if there is a functionality that will connect a wiring diagram or schematic to the mechanical cable wire and connector or termination models? We are looking at possibly upgrading to the premium package to get router but I would like to know more about it from someone who is using it. Nice presentation Ricky! Wow, you got me at awe!